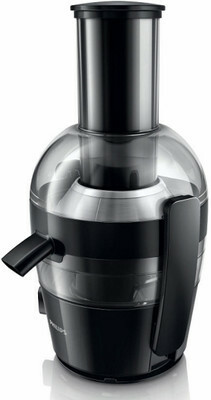 The moment you first lay your eyes on this juicer you fall in love with it. It has that irresistible charm which holds you and doesn’t let you go. Its performance is also very impressive. The quality is ever lasting. This appliance won’t give you any trouble even after years of heavy usage. Funnel is wide enough to put entire fruits inside it so no need to cut them thereby saving you time and energy. The blades are so sharp that they’ll u through fruits in seconds but you might have to hold the juicer in place as it will vibrate. The whole body aluminium so its sturdy, lightweight and stylish. This also aids portability of the juicer. The parts can be easily removed and cleaned in a dishwasher without any worries. The 700W motor is very fast and efficient and gets the job done in seconds. So much so that you may wonder how it happen so fast. All that superb juicing performance leaves a lot of dry extract which is of no surprise but you can use it for your manure or face pack if you want. Cleaning up the Aluminium filter is a pain if you do it manually, but doing it with a brush speeds up things. Usage of plastic bag is recommended before you start juicing in the extract container. This keeps the container dry and so no washing is required saving you time. After going through this appliance it would be safe to say that the look and feel of the product is definitely worth the price you pay. It takes seconds to juice out every fruit. This appliance has the best combination of performance, design of all the juicers in the market today and can be conferred with the title “Best Juicer”.